This lily takes minimum of 4 years to flower so has been a long term project but well worth the wait. Introduced to the UK in 1852 and originating in the Himalayas and NW Burma it grows to a height of over 6ft making it one of the largest lilies in the world. The fragrance is wonderful and can be smelt from a good distance. 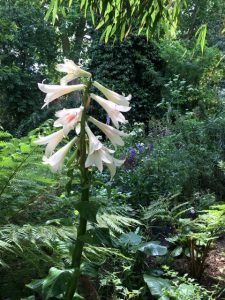 The lily in the photo is at the church end of the garden amongst the tree ferns but there are others elsewhere.